It is a requirement in the South African Law of Contract that, for a contract to come into existence, an offer to contract must be made by one party to the agreement (“the offeror”), which must then be accepted by the other party to the agreement (“the offeree”). It is pivotal to determine when and where such a contract is concluded, as this will give an indication as to which country’s system of law will govern the contract (assuming that all other elements for a valid contract have been satisfied). The offeree may communicate his decision to accept the offer to contract by posting a letter to the offeror, or by sending the offeror an email. The method of communication utilised by the offeree will affect the place where and moment when the contract comes into existence; and, ultimately, which system of law is applicable to the contract. The general rule is that a contract comes into being when and where consensus between the parties has been reached. This is typically the place where and moment when the offeror learns that the offeree has accepted the offer. However, there are exceptions to this general rule, which are discussed below. The court in Cape Explosive Works v South African Oil and Fat Industries Ltd 1921 CPD 244 explained that, when an offeree posts an acceptance letter to the offeror, the contract comes into being once the letter accepting the offer is posted to the offeror. In other words, the offeree need not follow up and ensure that the offeror has received his acceptance for the contract to be binding and enforceable. Section 22 of the ECTA provides that “[a]n agreement concluded between parties by means of [electronic communications] is concluded at the time when and place where the acceptance of the offer was received by the offeror”. Further, section 23 reads as follows: “[electronic communications] used in the conclusion […] of an agreement must be regarded as having been sent by the [offeree] when it enters an information system outside the control of the [offeree] or […] when it is capable of being retrieved by the [offeror]”. Therefore, unlike with a postal contract, the contract only becomes binding and enforceable when the offeree has sent off his electronic communication of acceptance of the offer to contract and the offeror has received or is able to retrieve such communication. In other words, the ECTA holds that a contract will come into existence where an email appears in the offeror’s inbox, but it has not been read; or, where the offeree leaves a message on the offeror’s answering machine, but the offeror has not listened to it yet. For example, if X, who lives in South Africa, sends an email to Y, who lives in America, informing him that he accepts his offer to contract, the contract will come into existence at the moment that the email has been sent to the offeror and once it is received or capable of being retrieved by the offeror. For that reason, as the email will be received or be capable of being retrieved in America, the system of law applicable in this situation would be American Law (assuming that all other elements for a valid contract have been satisfied). As South African Contract Law emphasises the freedom of contract, parties to a contract are entitled to agree to terms stipulating when and where a contract comes into existence. 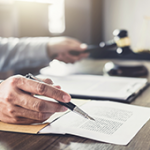 In sum, the system of law applicable to the contract will depend on whether the parties have agreed on a moment when and place where the contract should come into being. If no such agreement is reached, the applicable system will depend on the means chosen by the offeree to communicate his acceptance of the offer to the offeror. It is, therefore, advised that parties to a contract agree on a moment when and a place where the contract should come into existence in order to avoid confusion as to which system of law will be applicable to the contract. Cape Explosive Works v South African Oil and Fat Industries Ltd 1921 CPD 244. Van der Merwe et al Contract: General Principles 4 ed. Hutchinson et al The Law of Contract in South Africa 3 ed.